Mollenkopf presented one of the key examples of the SMACK Stack at work: a group of open source components led by Spark, and supported by Mesos (more specifically, Mesosphere DC/OS), the Akka messaging framework for Scala and Java, Cassandra as the NoSQL database component (although some have already switched to MariaDB), and Kafka for messaging. To this stack, the geospatial data provider Esri added ElasticSearch as a visualization and search engine, and the Apache Play Web framework for Java and Scala applications. “What this allows us to do is scale out any aspect of the system,” said Mollenkopf, “based on a customer need.” His argument was that it was not always practical for an enterprise to scale out an entire application environment simply to accommodate a near-term need for just one resource. Esri’s implementation is now called its Trinity managed service stack. In his interview with us at MesosCon, Astronomer vice president of engineering Aaron Brongersma told us the alternative to running the “S,” “A,” “C,” and “K” components on anything other than the “M” would have been to configure each of those components separately, including the strategies for scalability. Which would then mean, solving the problem of how to manage and scale the DNS service separately as well. “I’m not sure why somebody would say the parallelism needs of Spark can’t be handled on Kubernetes,” said Sean Suchter, Chief Technology Officer and co-founder of Pepperdata, in an interview with The New Stack. Suchter was a former vice president of search technology at Yahoo, before being famously grabbed by Microsoft in 2008 to lead its Bing search technology center. For the better part of this year, Suchter has been busy demonstrating a pipeline system that he claims not only integrates Spark with Kubernetes, but effectively makes them partners in the scheduling of analysis-intensive containers in Kubernetes pods. Kubernetes is an open source project managed by The Cloud Native Computing Foundation. Spark already has a means with which to instruct the engine to scale the number of executors it has in use, based on its own assessed needs of the current workload. So any claim that, for instance, only Mesos may be capable of dynamically scaling one component of the stack independently, may in Suchter’s view be ignoring the last few months of work that other elements of the open source community have devoted to Spark. Last August, the Spark community approved the posting to GitHub of a fork of the latest Spark 2.2.0 release demonstrating the substitution of Spark’s native cluster manager with Kubernetes. It was never supposed to be open-heart surgery to begin with; the fact that Spark has run on Mesos is already an indicator that Spark is indifferent on the subject. Yet as was demonstrated more than once during the last Spark Summit, Kubernetes and Spark won’t exactly behave as “decoupled” components. In fact, they genuinely cooperate: The usual spark submit script will send jobs to the Kubernetes scheduler, which responds by scheduling a Spark-specific driver. As the driver requests pods containing Spark’s executors, Kubernetes complies (or declines) as needed. Executors in turn will run Spark tasks, just as they would before. The Spark driver will handle cleanup. It’s a sophisticated chain of events: from the submittal process, to the driver, to the executor, and finally to the tasks themselves. But it also means that Spark containers can share the infrastructure with pods containing other tasks. The goal is that Spark can share whatever infrastructure there may be, with whatever else is already running there. Would this goal require Kubernetes to run any special configuration? No, says Pepperdata’s Sucher. Has Pepperdata accounted for the growing popularity of co-processing hardware, such as FPGA accelerators and general-purpose GPUs (GPGPU), which utilize parallelization uniquely? Suchter could not respond with respect to Kubernetes on Spark. But with respect to his company’s existing release editions of its database optimizers for YARN, they already monitor how parallel data jobs run on various hardware configurations, including with accelerators. It’s pretty much a necessity, the CTO told us, in order to provide the determinism and reliability of performance that Hadoop users (in the case of YARN) expect. You’ve already seen, if you read The New Stack frequently, how supporters of multiple orchestrators, including both Mesos and Kubernetes, are supporting the development of the Container Storage Interface (CSI). It’s a mechanism for providing containers with access to persistent storage, theoretically enabling stateful connections to persistent databases or even to huge data lakes. So you’d be surprised to learn that Pepperdata’s Suchter is arguing that such a connection may not be necessary, or even desirable, in a highly parallel scenario involving Hadoop or Spark. Indeed, he and his team have been working on something else: a way to integrate the HDFS file system directly with containers, by way of Kubernetes’ existing storage abstractions. It’s a strong argument by a veteran (and valuable) search system developer that pokes a big hole in the case in favor of the SMACK Stack. If components cooperate at a deeper level, says Sean Suchter, you may not need much in-between them. And two interwoven elements could do the work of five in a stack. Yet with Spark 2.2.0 having only been released last month, it’s an argument that awaits hard proof. 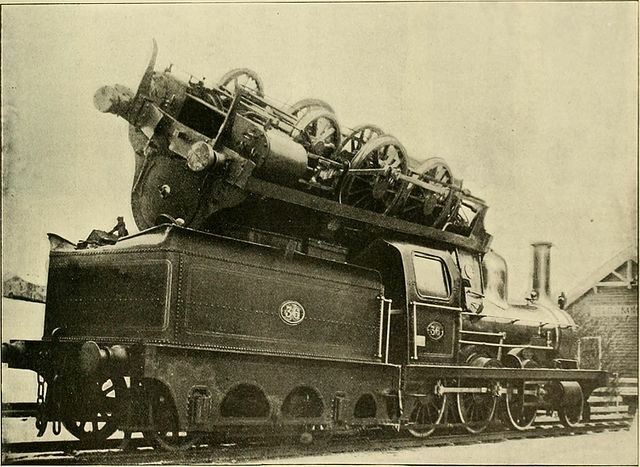 Feature image: An 1893 incident where an exploded boiler from a steam engine landed neatly on top of another (none were hurt).